Morning Glories: FYI Friday--physical AND emotional health remedies and a recipe! FYI Friday--physical AND emotional health remedies and a recipe! So as much as we love fall, we all know that October officially starts the cold and flu season. Yuck! We also all know that washing our hands is the #1 way to prevent yourself and your children from getting sick! Getting sleep (which I've been terrible at lately) is close behind! I'll save you the nitty-gritty details, but you can look them up if you doubt me! 1. We've heard (and this is the only one I've not researched) that grape juice can help prevent the tummy bug! With my fear of throwing up, or having anyone in our family throw up, you can guess why we drink it on blind faith. Why not? Grape juice is healthy for you anyway!! BUT--I did read that you should drink the 100% juice--not the concentrate kind. Harder to find, and usually we use Welch's, but we found this brand for now! A couple of glasses a day, keep the throw ups away!? At least we're believing it! 2. 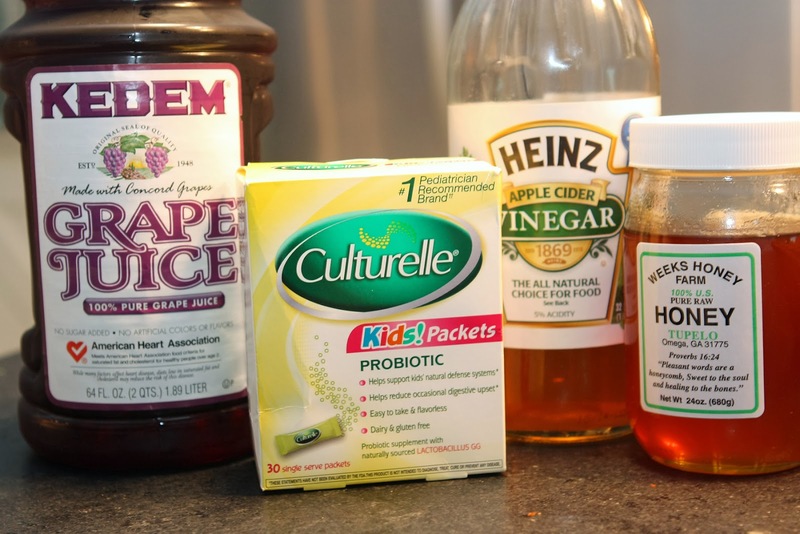 Our doctor's office swears by Culturelle. They've told us to put it in yogurt or to buy the yogurt with the probiotics in it anyway, when the children are on antibiotics. Hmmmm, now that I'm typing that, I see "biotic" relationship there. Guess it takes some of us longer. Anyway, it's supposed to help with the upset tummy that antibiotics cause, but our nurse tells us it helps prevent tummy bugs too. Again, whatever I can do!!! 3. I have chronic sinus infections. I think I've cut them down to 2 a year, but Hubby still says I'm at 3-4 a year. I can't keep them straight, but they make me feel miserable!! This past Spring I read that apple cider vinegar works wonders in cutting and thinning out all the goop in your nose and head. I despise the word mucus, so I'm calling it goop, but I just typed that other word, so oh well. Anyway, I tried it and this past Spring was the first time I "cured" a sinus infection without having to be on an antibiotic!!! Hooray for apple cider vinegar! Additionally, there are so many other health benefits of vinegar. You should look it up. But, I add a teaspoon or two to a glass of water and drink it down a couple of times a day when I feel a cold coming on. I actually like the taste, but that's just me! 4. Maybe you know about this last one. Honey is also supposed to be good for colds. Yes, put some honey in your hot tea when you have a sore throat! BUT, eating/swallowing a spoonful of honey or two a day, is also supposed to lessen the effects of or prevent colds. They key, though? RAW honey! Not the honey bear you get at the grocery store, but the kind you get at a health store. I have just beaten another cold, and I think it's because I went to Whole Foods after learning about RAW honey and have been having 2 spoonfuls a day! Good stuff! NOW---physical health aside, there's also something to be said for emotional health. And I believe chocolate is my #1 way to ensure my emotional health is stable! :) I kid. A little. This is one of my fave treats! I discovered it last year, when I tried my first-ever salted caramel mocha from Starbucks. I had to find a recipe to actually eat and not drink that combined these flavors!! So, here's the recipe! How to make. . .
Preheat your oven to 400 degrees. Then line a cookie sheet with foil. It's good to make sure your foil covers all of the cookie sheet, so you may just want a smidge extra foil to fold over the sides. Next spread out pretzels over the foil. Do your best to have them in a flat layer--though since they won't all fit perfectly some can overlap! Next melt your butter in a saucepan. Once butter is melted, then add the sugar. This makes the caramel. Stir frequently. It will bubble and simmer, but don't let it boil. 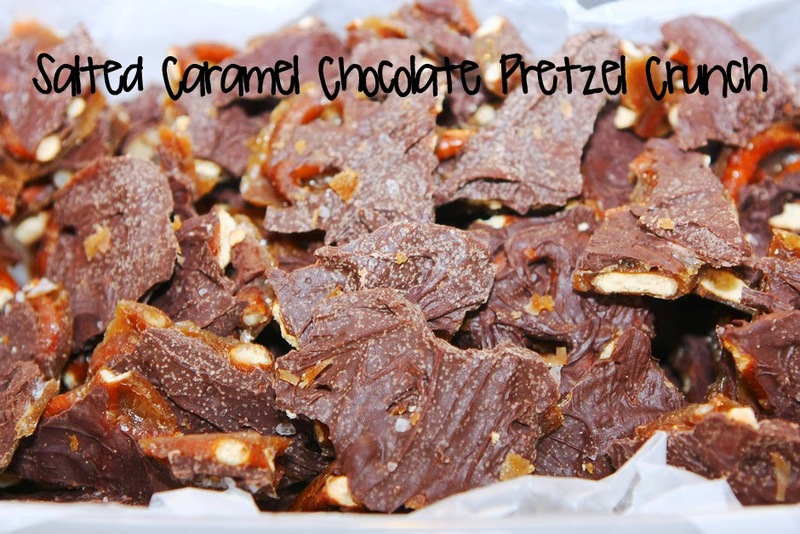 Once the color turns a little brown and more bubbly (about 3-5 minutes), then pour the caramel over the pretzels. You may want to start at one end of the cookie sheet and pour from end to end, back and forth. The caramel may not cover or spread over every pretzel when you pour it on, so take a spatula or spoon and spread it out. It hardens fairly quickly, so just be on top of it! Ideally, every pretzel gets some caramel on it! Then pop it in the oven for 6 or 7 minutes. You can keep an eye on it and you will see it bubbling in the oven. Once that's in the oven, pour the chocolate chips in a microwaveable bowl. Wait until the pretzels are almost ready to come out of the oven and then pop the chocolate chips in the microwave for about a minute. You don't want them to be completely melted, but enough so they can be spread out over the pretzels. Take the pretzels out of the oven and spoon the somewhat melted chocolate chips over the pretzels. Smooth them across the pretzels with a spatula. If the chips are still in full form, they will quickly melt over the pretzels, so no worries! Sprinkle the sea salt over the top and then put them in the fridge and chill for an hour or so (if you can wait that long). When you take them out, the foil should peel right off and you can crumble the mixture into the most delicious bites you will ever pop into your mouth! Forgot to mention...honey works wonders for allergies if you take the LOCAL honey. But, don't do it for too long...baby girl developed a sensitivity to it because she was downing it everyday!!! I have read about the grape juice thing as well - I buy it now for that same reason. Also - we use Culturelle due to the constant ear infections we have/had around here. There are also drops called BioGaia that you can get at the pharmacy for little ones. They are a little pricey - but work great and last awhile.